Amazon.com description: Product Description: Richard Dawkins transformed our view of God in his blockbuster, The God Delusion, which sold more than 2 million copies in English alone. He revolutionized the way we see natural selection in the seminal bestseller The Selfish Gene. 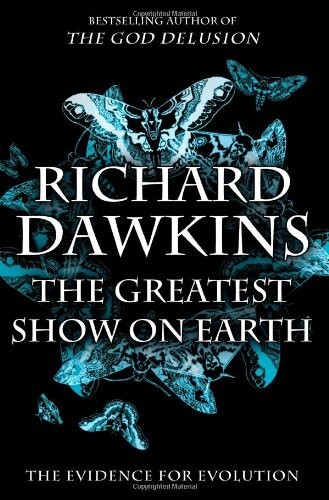 Now, he launches a fierce counterattack against proponents of "Intelligent Design" in his latest New York Times bestseller, The Greatest Show on Earth. "Intelligent Design" is being taught in our schools; educators are being asked to "teach the controversy" behind evolutionary theory. There is no controversy. Dawkins sifts through rich layers of scientific evidenceâfrom living examples of natural selection to clues in the fossil record; from natural clocks that mark the vast epochs wherein evolution ran its course to the intricacies of developing embryos; from plate tectonics to molecular geneticsâto make the airtight case that "we find ourselves perched on one tiny twig in the midst of a blossoming and flourishing tree of life and it is no accident, but the direct consequence of evolution by non-random selection." His unjaded passion for the natural world turns what might have been a negative argument, exposing the absurdities of the creationist position, into a positive offering to the reader: nothing less than a masterâs vision of life, in all its splendor.